With a charming smile, a wink and empowering stage presence Siscy Blu presents technological trends and products. Christine Astor has devoted herself to the highly topical themes „Trends of the Future“ and „Digitisation“ for her latest show and worked together with leading trend agencies and future researchers. The result? A superlative event program full of surprises: “Future Now – There is a life between 0 and 1”. Professionals and viewers are thrilled! Christine Astor has succeeded in making a litter, which sets a new trend. She skillfully combines the latest technological developments with an actor’s talent, wit and music. Digital transformation and innovation are about to revolutionize our lives. Learn how the trends of the future can already guarantee your success today. 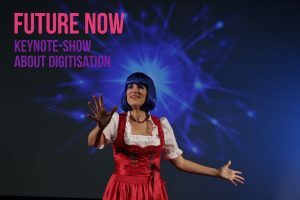 Future Now – An entertaining infotainment show on technological innovations, megatrends, artificial intelligence and robotics. In this funny Keynoteshow, Christine Astor provides orientation in the jungle of technological developments and trends. She is able to draw a fine line between technical innovations and the trends that are relevant to your company. „Future Now“ entertains, stimulates thoughts, inspires and informs in an impressive way. Your guests, customers and employees experience an inspiring event. At the same time, the show meets so many absurdities of our modern life with a wink. And this makes your employees and guests the most touched with digital transformation and robotics. A must for your future-oriented event or an extraordinary theatrical evening. The show has a modular structure and is adapted to your event according to the event and the industry in its thematic focus and duration. 19 years of management experience at the R&D strategy department and five years as a Trendhunter in the Innovation Department at BMW are the solid base for the content of „Future Now“. As a charming entertainer, she has what it takes to deliver such complex content in a convincing, enjoyable and humorous way. Digi-Physic. Merging the physical and the digital world. Human Enhancement. The optimization of humanity and health. AI. Robotics and Humanity at the interface of a new era. In the s cientific details close cooperation with the best future research and trend agencies takes place. To be up-to-date with the latest news. Only developments that already exist are shown. The audience will be amazed at what is already possible today. At the same time, they are depriving them of their contact with future technologies and robotics. After the show Mrs. Astor can also guide a discussion round in English, German, French and Italian. She is versatile, her keynotes are available both in English and German.